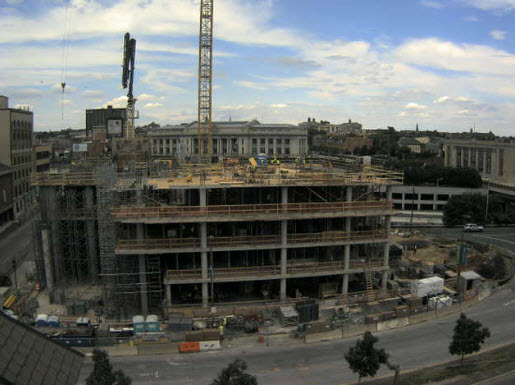 Construction on the new John and Frances Angelos Law Center at the University of Baltimore is well underway. Travelers on Charles Street can see the girders climb out of the foundation that was poured this winter. (You can see it, too, through our live webcam! http://tinyurl.com/3plmpmo) The building has now reached the fourth floor of what will be a twelve story building. The new library space has significantly affected our approach to collection development. We are taking the plunge and often relying solely on electronic resources for primary sources material. Only a few years ago it would have been inconceivable for an academic law library to jettison the National Reporter Series or the statutes of all of the states; now it’s an easy decision. Most states publish their cases and statutes online now, plus students and faculty have access to Lexis and Westlaw. We also provide public access Lexis for lawyers and members of the public who come to research. It doesn’t provide the full coverage that regular Lexis does, but it does make primary law readily available. Once the new building is occupied, the law library footprint will have both expanded and contracted. Our physical space (and in particular, our shelf space) will be much smaller. On the other hand, by emphasizing electronic resources, the library reaches beyond the physical confines of the building to serve our patrons wherever they travel.